Whenever Meghdoot patches are installed, we need to register the DLL files replaced. Here is a tool created from the coding provided by Mr. Nordin Rahman. The original coding is not known. 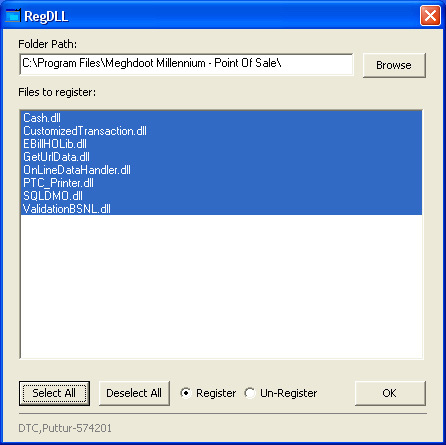 All OCX,DLL,TLB files in a directory can be registered/unregistered. Sir. Thank you very much this useful tool. It is not intentional. I am getting the following message when I add sapost to my bloglist. "Could not detect a feed for this URL. Blog posts and update time will not be shown. Add URL anyway?" Pl intimate if any solution is known to you for this issue.